Paul thanks Philemon for refreshing the hearts of the Saints. Who refreshes your heart? I must admit that I was completely unaware of the presence of Paul's letter to Philemon in the Bible until about three years ago when I studied it as part of a Bible Study called "Christian Living". Despite being such a short book, I can say that this little letter softened my heart at that time in such a profound way that I knew again, that God does not waste a single phrase in His Word. In this letter we find Paul appealing to Philemon to forgive his slave, Onesimus, who has stolen from him and run away to Rome. While in Rome, Onesimus has met Paul and become a Christian. According to Roman law, Onesimus should be returned to Philemon where he would have the right to punish him harshly to include executing him. Paul appeals to Philemon, as a brother in Christ, one who is free to make decisions based on the the teachings of Jesus's love and forgiveness above any other. The overarching message for me here was really a challenge from God about my ability to forgive. As Christians, we are set apart. We are commanded to forgive others as we have been forgiven. Most of us sit in our pews and say it out loud in church every single week. Then we go out into the world where we notice sin at every turn. Unfortunately, we generally are focused on the speck in another's eye without looking at the plank in our own, but in any event, it is true that there will be times in our lives when we will be "sinned against". Oftentimes we will seek out friends and family to hear our plight and they can be all too willing to jump into shoring up our righteous indignation as opposed to encouraging us toward compassion and love. We often will surround ourselves with folks who will confirm again and again that our hurt and anger and spite toward the offender are fully justified. And here's the rub: lots of times we are justified. 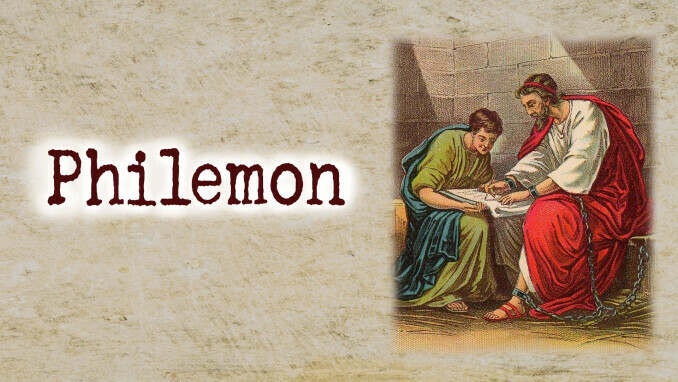 At the time I first read Philemon, I was hurting. People I loved were hurting. No doubt about it. And frankly, I was tired of it. But as a Christian, I could not sit in my hurt and anger and let that be the end of the story. The challenge to me as a follower of Jesus was to see if I could, in the muck of that ugly truth, find the love to forgive. Despite my present circumstance, despite how I felt we'd been wronged, despite that I could find a slew of people to confirm that I was justified in my anger and my bitterness, I knew that I was called by my God to forgive. This is what we see in Paul's plea to Philemon. Philemon, by the world's standards has every justification and every right not to forgive his runaway slave. But Paul appeals to him as a brother, a leader, a friend, and a fellow follower of Jesus. Certainly, forgiveness can look different in different situations. Often, it might mean that while we can forgive, we can't continue a relationship. And yet, as Christians, we simply must give forgiveness as much attention as we give our anger and pain. We're called to it. The good news is that we have the greatest example of forgiveness that the world has ever seen in our Lord and Savior, Jesus Christ. And when we forgive others, we recognize again the gift of what He did for us. How blessed are we to have been given this example? How could we not be inspired by it to do the hard work of forgiveness? I can tell you, that at least in my experience, the work is well worth it. Holy Lord, thank You for Your example of forgiveness. Thank You for sending us people like the Apostle Paul who will use truth and love to appeal for us to choose compassion and forgiveness instead of judgment and anger even when the world tells us the opposite. We know we can only fully do these things because of and with You. Amen.